Blue Ribbon has four delicious ranges of quality bread: Standard, Classic, Toaster and Lifestyle. 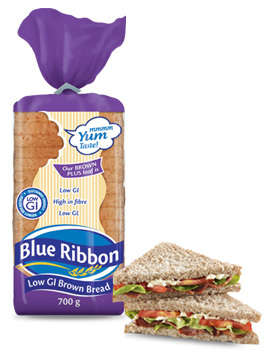 Blue Ribbon Classic loaves are shorter and wider, with bigger slices for perfectly-filling sandwiches, while the Standard range of Sliced and Unsliced loaves are longer and thinner with smaller slices – perfect for lunchboxes. Blue Ribbon Toaster loaves pack thicker, made-for-the-toaster slices, ideal for crispy-on-the-outside, fluffy-on-the-inside toast that doesn’t tear when you butter it. Blue Ribbon Lifestyle loaves are especially designed for bread lovers looking for delicious taste and convenience in a healthier loaf – they’re low GI, low GL and high in fibre. Our Whole Wheat Brown Bread is the perfect choice for the health conscious. Packed with fibre for happy tummies, and high in vitamin D, it delivers a nutritious and delicious MMMM yum taste with every sandwich. A tasty loaf with low GI to keep tummies fuller for longer and low GL for low impact on blood sugar levels. It’s also high in fibre for digestive health. This delicious bread is perfect for health-conscious bread lovers. A tasty brown loaf with crushed wheat, for lip-smacking flavour and texture. It’s high in fibre for digestive health, low GI for slow-release energy and low GL for low impact on blood sugar levels. Ideal for making nutritious sandwiches, or as a delicious side with meals. This soft and scrumptious loaf is high in fibre for digestive health, with all the yummy fluffiness of white bread and the benefits of brown – perfect for fussy eaters. It’s low GI for slow-release energy and low GL for low impact on blood sugar levels, with large slices for maximum mmmm yum taste. Who doesn’t love toast? Especially when it’s perfectly crispy on the outside, soft and fluffy on the inside and fortified with vitamins and minerals. Toaster Brown is designed to fit snugly in your toaster, so no more untoasted edges or the need to turn slices over. Its slightly thicker slice means your toast won’t tear when you spread on lashings of butter and jam. It takes a special slice of bread to make the perfect toast – and we’ve got it. Our Toaster White slices fit perfectly in your toaster – so you can enjoy golden toast from middle to crust. Thicker slices mean your toast is crispy on the outside, fluffy on the inside, and a welcome base for butter and other spreads. The best part, our Toaster White loaf is fortified with vitamins and minerals. Specially designed and baked for a larger slice, this delicious brown loaf is perfect for big sandwiches crammed with scrumptious fillings. These supreme sandwich slices are also fortified with vitamins and minerals for better health – and packed full of yumminess. If you’re looking to make super sarmies packed with yummy fillings, this tasty all-rounder is a winner. Classic White Bread has larger slices for a better feast, and is fortified with vitamins and minerals. Lunchbox sarmies have never tasted so good. Our Brown Sliced loaf is longer and thinner with slices that fit perfectly in school lunchboxes, for the ultimate fresh, nutritious break time snack. And the best part? It’s fortified with vitamins and minerals. Bread for the coolest kid on the playground, this lunchbox-ready loaf is longer and thinner, so slices fit snugly into school lunchboxes. Rich in that mmmm yum taste and fortified with vitamins and minerals. A versatile loaf that gives you the freedom to cut your slices just the way you want them – ideal for making a spicy bunny chow or piling together a tummy-filling kota. This soft and fluffy loaf is fortified with vitamins and minerals. Have your slices just the way you like them. The versatile Unsliced Brown loaf is perfect for making kotas or bunny chows, or for cutting your own thick slices to smother with butter and jam. Like all Blue Ribbon Bread, it’s fortified with vitamins and minerals.